St. Germain Garden was just as presented in the photos. The apartment is tastefully decorated and comfortable in all ways. The large garden buffers all noise from the city, and the location is ideal (a two minute walk from Blvd. St. Germain, close to metro, upscale shopping in surrounding streets). We will likely stay there again. This is the second apartment we've rented from Paris for Rent, and the service they provide is exceptional. The staff is professional and highly accommodating. Communication was excellent. Anything needed was provided. Without question we will rent from them again. We've stayed in a number of apartments in Paris, and the St. Germain Garden is at the top of the list. It is a comfortable as it is lovely, with 2 separate beds, 2 toilets, an astonishing amount of storage space, and comfortable furniture for relaxing after a full day of visiting Paris art museums. The apartment has everything necessary, including large, soft, luxury towels in the bathroom and plenty of hot water. The washer and dryer were easy to use and made it possible to pack lightly. The heat was welcome for our stay in November and warmed the apartment quickly. The location, just a block off Blvd. St. Germain in the 6th, was perfect. And since the apartment faces a lovely courtyard with trees and a fountain, it was peaceful and quiet while still in the center of the city. We absolutely loved our stay and will definitely stay there again. And the Paris for Rent staff was wonderful, from check in to check out. We had a splendid eight nights at St Germain Garden. We especially liked the quiet of the garden location, and the spacious accommodations were perfect for three. It was very nice to have bath, dishwashing and clothes washing soap provided for us. We found the kitchen compact but perfectly equipped for one cook at a time. One suggestion would be to provide a list of the nearby bakeries and their open and closing days since these are essential to life in Paris and sometimes located in out of the way places. Highly recommended and we would be more than happy to return some day. This lovely place exceeded our high expectations. Set in a beautiful building on a quiet street, with a view onto a lovely enclosed garden, this place gave us the feeling of being residents of Paris, rather than tourists. The apartment is thoughtfully and beautifully decorated, all of the appliances and systems worked perfectly, and the bed was comfortable. It truly felt like a home away from home. 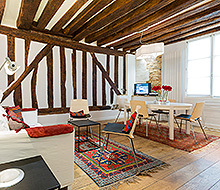 Perhaps even more impressive than the apartment itself was the service from Paris for Rent. Patrick and his team made the whole experience painless. Though our flight was delayed by more than four hours, our car was waiting at the airport, and the Paris for Rent realtor met us on the street at the apartment. Though the delay must have caused her some measure of inconvenience, she took her time, and was truly lovely in the way she showed us the place, explaining how everything worked, and showing us on a map where we could find the closest supermarkets, and Metro stations. We so appreciated that level of care after the frustrating trip over. Truly, both the apartment and the service were top notch. We have already been in touch with Patrick about scheduling our next trip. Merci beaucoup to Paris for Rent. 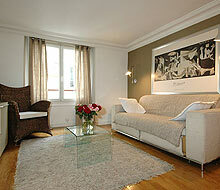 The location is superb - in the heart of St. Germain and just a few blocks from 3 different metro lines. The apartment is bright and pin-drop quiet and is decorated in a modern style with comfortable beds, a luxury bathroom with 2 separate toilettes. The kitchen is fitted with top line appliances along with a washer dryer. We would not hesitate to rent again! The property is fabulous. Greenery, quiet, location, comfort and security. All in Paris. Anyone should be so lucky. (Suggestions: bathrooms need improvement. Some fixtures look like they are ready to fall off or tear away from the wall. Other finishing touches by the general contractor need to be looked at. Light for dinnerware, glass closet stays lit when door closed. As a higher end rental apartment rental offering guests simple amenities like a makeup mirror, supplying facial tissues and the like are welcomed. No broom or dust pan to be found. And an unusual question for the owners and design: why five doors all opening into one another entering the toilet, closets, and bathroom area? Crazy use of space. Additionally on the opposite side with the kitchen, toilet, entrance door. I have never seen so many doors for such a relatively small space. Just wondering. I own rental property - San Francisco/Mexico - my suggestions, I hope, help.) And, I will come back. Hidden Gem in the Heart of St. Germain! 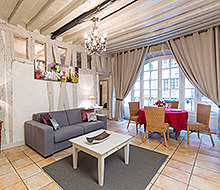 Absolutely fabulous apartment in St. Germain. The perfect base for a wonderful week in Paris. We will be back! Very comfortable for the 3 of us. Quite location in a lovely location.